The radiation pattern is optimised to peak toward the horizon, with a gradual reduction in gain towards the overhead sky. This is intended to give good results for Satellite operation and High Altitude Balloon tracking, whilst still providing maximum gain towards the horizon for terrestrial operation using both horizontal and vertical polarisation. 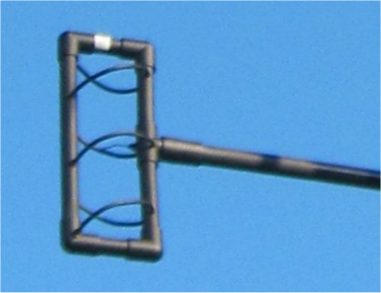 This makes it ideal for use on bands such as 2m & 70cm, where both polarisations are commonly used. 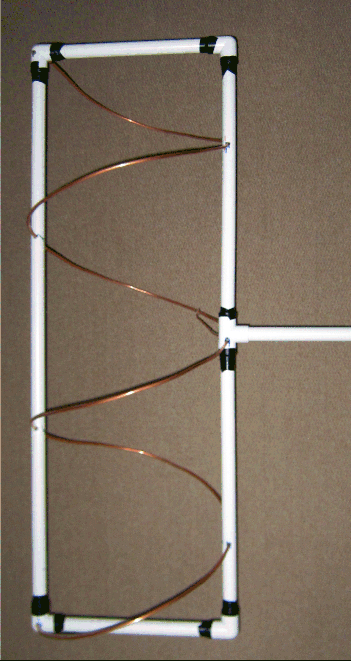 Since originally designing this antenna, I subsequently found a paper entitled 'The Helical Antenna' written by J. Kraus, W8JK (SK) which was published in the Proceedings of the IRE Volume: 37 Issue 3 - 1949 Page(s): 263  272. 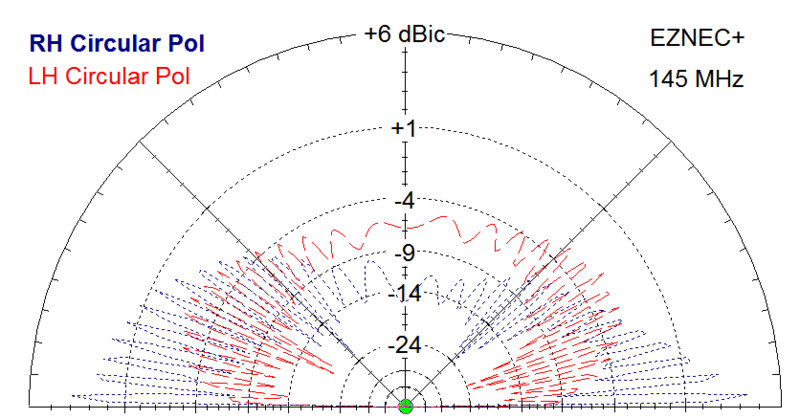 In this article a distinction is made between the Normal (Omni) mode of radiation when the helix circumference is smaller than about 1 wavelength, and the Axial (Beam) mode of radiation when the helix circumference is about 1 wavelength. In the normal mode, depending on the helix geometry, the radiation may, in theory, be elliptically, plane, or circularly polarised. 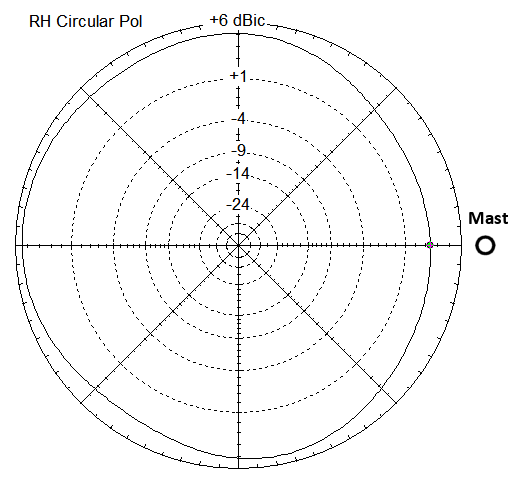 For circular polarisation to occur the ratio of π x Diameter of Helix has to be equal to the Square root of (2 x the Spacing between turns x Wavelength). 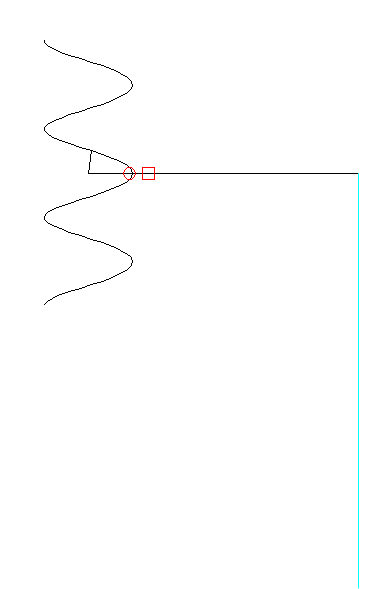 So any helix which has a suitable Diameter to turn Spacing ratio will produce a circularly polarised radiation pattern at right angles to the length of the helix. However this formula starts to break down when length of the helix starts to exceed that of a single ½ wave dipole. Any deviation from this ratio would result in elliptical or linear (only horizontal or vertical) polarisation. So only 65 years after Kraus published, I manged to hit upon the same ratio ! 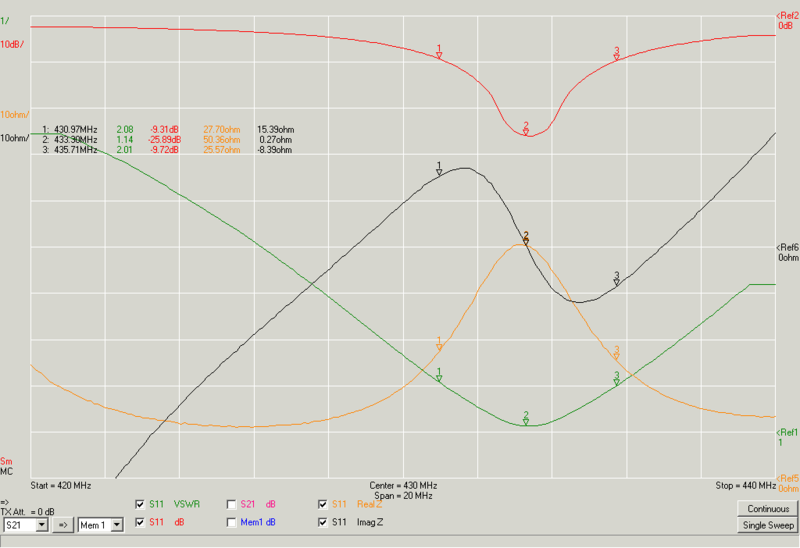 Next a plot showing the modelled gain in both planes, when mounted 10m above ground and fed with coax. Fixed the antenna to a short length of plastic tube in the workshop, and checked with a hand held fluorescent tube to see if the voltage distribution looked even between turns. Got the lamp to strike and then wound the power down to about 5 watts so that I could see the areas of the tube that remained lit up more clearly. Observed four distinctive bright spots of similar luminance (although it's not that clear in the photo) at each of the high voltage points. Decided to check the difference in field strength between Horizontal and Vertical polarisation, by connecting the antenna to the VNA output and a small dipole to the VNA input. Held the dipole about 2 wavelengths away and rotated it between horizontal and vertical polarisation. Although this isn't the ideal environment for antenna measurements, the received signal levels on each polarisation are remarkably similar. 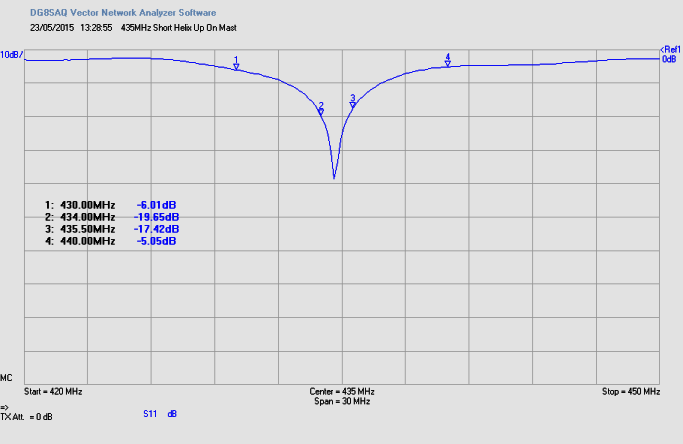 Looks like about 8MHz bandwidth between 3dB points, not too bad for elements made from 2mm diameter wire. Larger diameter tubing would give a much wider operational bandwidth. Final version built from 22mm plastic water pipe and 5mm copper car brake pipe. 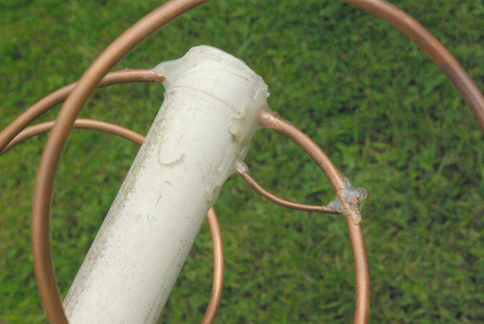 The turns of copper pipe are held in place by a single turn of thin copper wire wrapped around the pipe and soldered close to the plastic pipe. The antenna is quite high Q so requires some fine tuning once built. 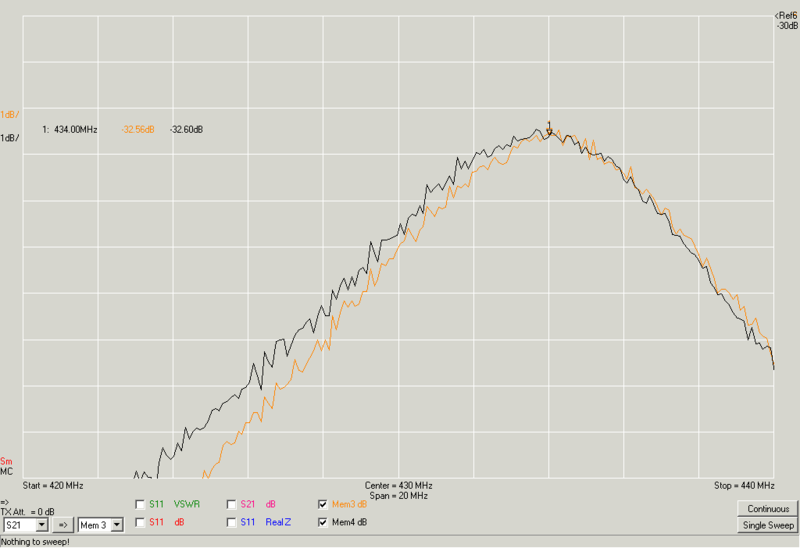 I made the last turns slightly longer than required and then cut them to resonance. Painting the antenna will lower the resonant frequency slightly. Very fine tuning can be achieved by bending the gamma match wire. Two or three suitable ferrite beads also need to be placed on the coax inside the boom arm near the feed point, in order to choke off common mode currents and create a balanced feed. The support boom was made with an inner of 22mm water pipe and an outer of 25mm plastic electrical conduit. A plastic conduit straight coupler can be persuaded to fit over the 22mm Tee by warming it with a heat gun. The whole assembly is not waterproof, so the coax connection to the feed point needs to be protected with something like epoxy resin, hot melt glue or silicone sealant. A small hole also needs to be drilled in the bottom of each length of plastic tube, to allow any water that does collect inside is able to drain away. 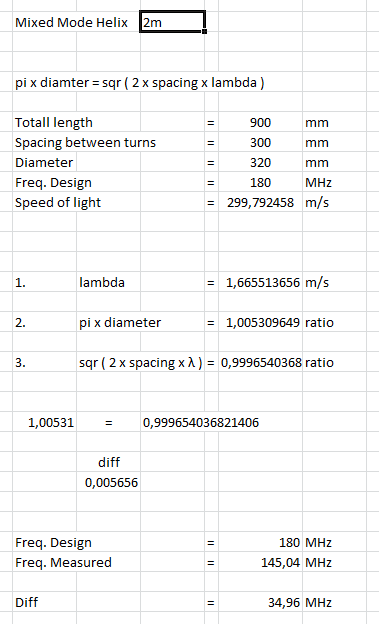 One constructor, Fons Buitelaar, has provided a copy of his calculations, based on the dimensions I have used. This gives a good indication of the best dimensions to choose. 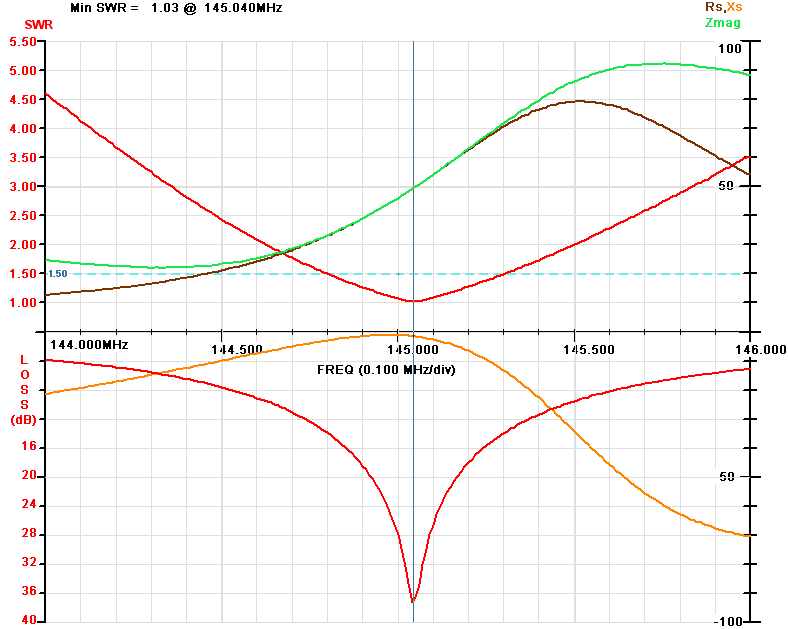 Graph showing the measured input impedance and SWR. 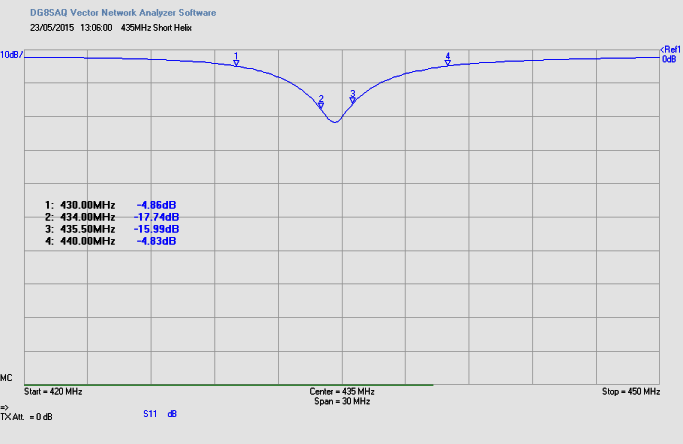 Southampton University Wireless Society Farnham WEB SDR. 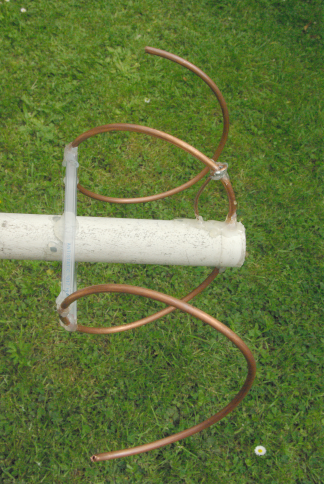 Andy Talbot, G4JNT http://www.g4jnt.com/ has also constructed a version of this antenna, using a slightly different mounting technique. Andy has reversed the direction of the feed coax so that it passes through the center of the helix. This simplifies the mechanical construction, but may affect the polar diagram causing some eccentricity, especially in the horizontal plane. 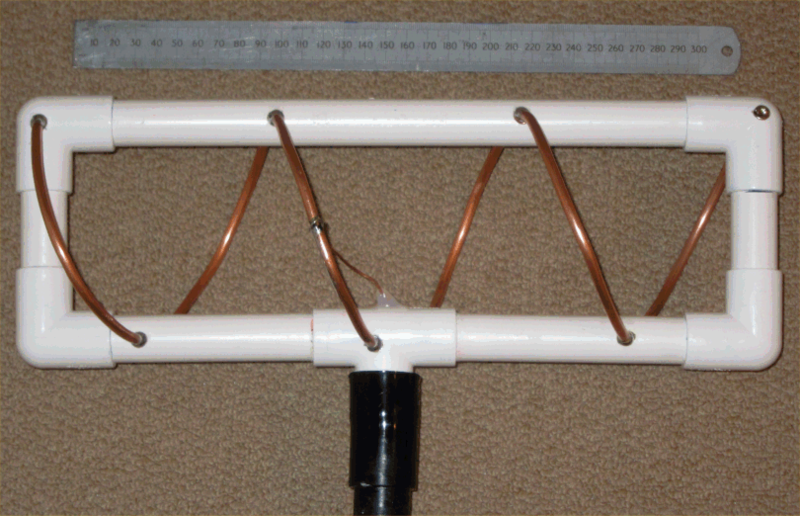 "I've managed a successful breadboard of the short helix antenna on Martin's website, using copper brake pipe a bit under 5mm diameter. Its in free space, supported just at its centre point by passing through two diametrically opposite holes in a piece of glass fibre tubing. My biggest problem was what length to cut off the reel to start with. 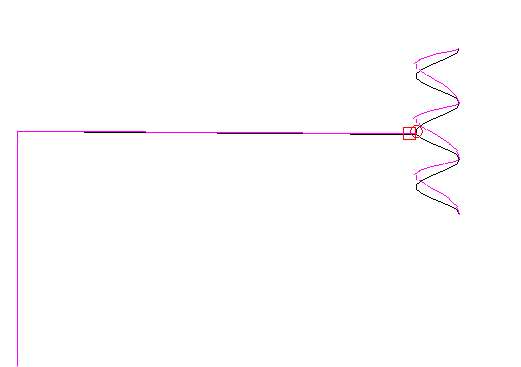 The diagram shows three turns in total with a diameter of 120mm and overall length for the antenna of 330mm. So first estimate for material required would be 3 * circumference plus length, ie 3.3PI.120mm + 330mm = 1470mm which seemed a bit much, but did so anyway. The turns were too many, but I measured what performance was at that point and got a nice sharp peak way down too low at 360MHz. 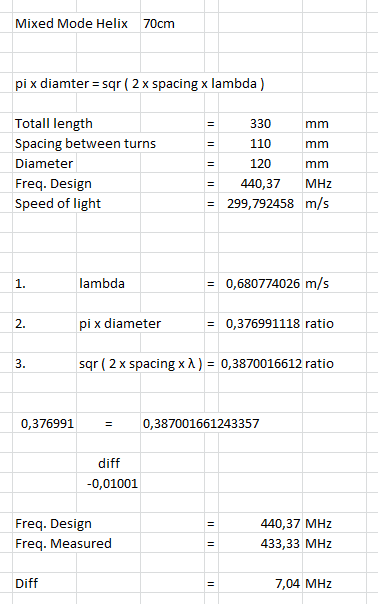 Obviously very wrong in calculation of length of material needed. So cut off chunks of conductor - fortunately copper pipe cuts well with large wire cutters - and after a bit of fine tuning got a good dip at 435MHz. The match is quite sharp, with a sharp dip to better than 20dB return loss, and a width at the -13dB RL points of just 1.8MHz. So it is quite a high Q antenna. The centre frequency can be shifted a bit by bending the elements to get it spot on ASSUMING they werent cut too short to start with. Now for some waterproofing. OR, I could just build another one using plastic plumbing fittings exactly as Martin shows"
"AND, now realised I wound it for Left Hand CP , or at least used a LH helix. Never even thought about that aspect." Andy also commented that the badwidth of the antenna was quite narrow and wondered if this was due to the use of a gamma match. I'm not sure if this is due to the gamma match that causing the narrow bandwidth, I suspect it could be the coupling between turns of the helix that forms a High Q tuned circuit, a bit like a large helical resonator (which is really what it it). 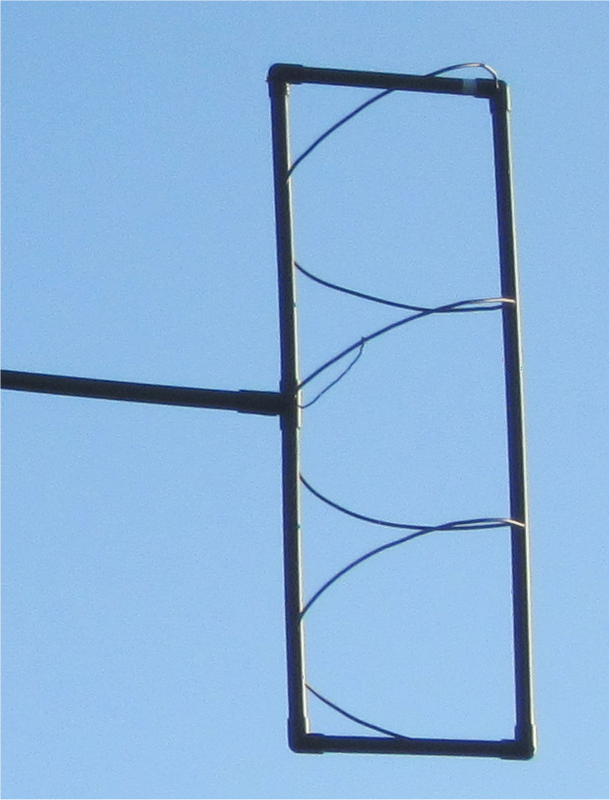 That's partially why I added such a rigid support structure, in order to keep the spacing between turns constant and stop it from going off-frequency when mounted on the mast. My thanks to Andy for allowing me to use this information. The helix is about 1m long, 300mm in diameter with 300mm spacing between turns. The exact length of helix has to be trimmed for resonance (zero reactance), and the gamma match is then adjusted for lowest SWR. I built this version using 5mm copper brake pipe and 22mm plastic water pipe with 90 degree bends ends and a Tee. The pipe joints still need to be glued, and the whole assembly waterproofed and painted. The antenna has a fairly high Q and moderately narrow bandwidth, so any flexing of the helix can change the impedance match quite dramatically. The 5mm brake pipe I used is really a bit too soft for this size of helix, so I had to add an additional bracing section to keep it in shape. 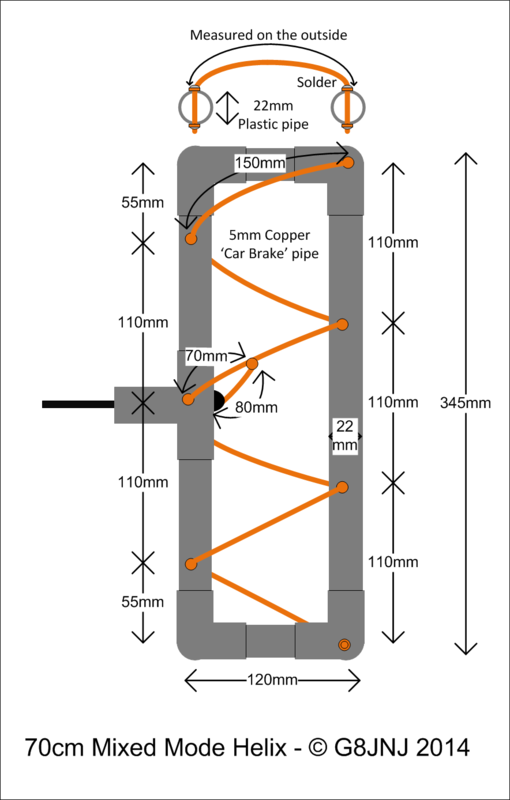 Although I made the first antenna with 5mm copper car brake pipe, I suggest that 8mm copper central heating pipe may be more suitable for the 2m version and provide a slightly wider operational bandwidth. I also had to use a short length of rope from the top corner of the antenna to the support mast, in order to help support the weight of the antenna and prevent the 1.5m long boom from sagging. 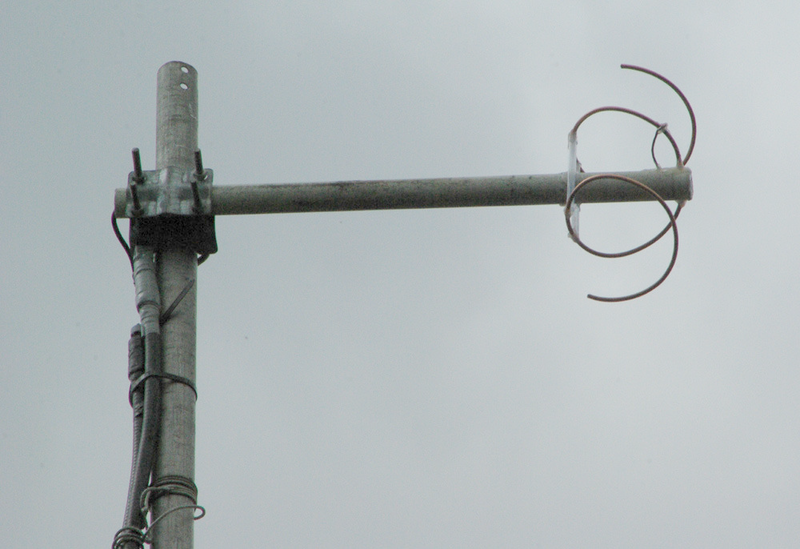 A length of aluminium tubing placed over the boom arm may help improve the stability in high winds. Note:- One constructor, Fons Buitelaar, has suggested that the dimensions given in the drawing lower down this page may be flawed. I suspect that he may be correct but I have not so far had the opportunity to verify the exact dimensions, as the antenna is currently 70m up a tower. Here is a copy of the spreadsheet that Fons provided, which indicates the size of the error. Modelling produced some good plots, which seem to be representative of the measured performance. When constructed as shown, the radiation pattern is predominantly Right Hand Circularly polarised at low angles of elevation. 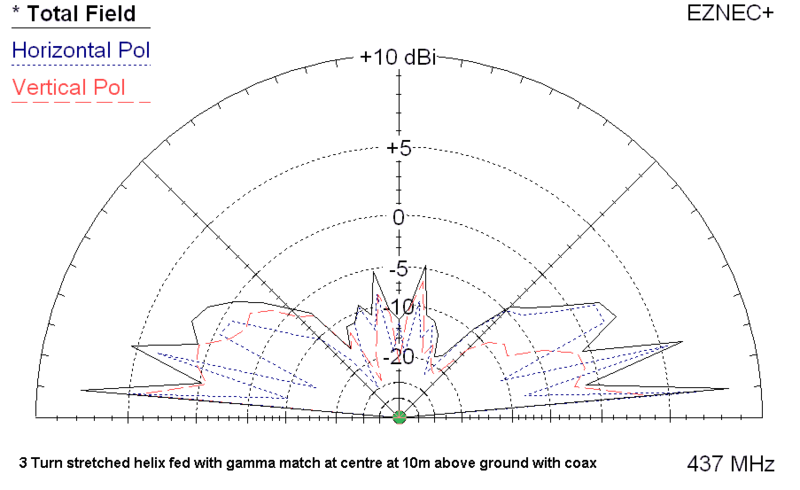 Pattern is Omni-directional with very slight asymmetry due to the gamma match and interaction with the mast and feed coax.